It’s no secret that Thor has recently made his much-anticipated return to the Marvel Universe, following more than two years’ worth of hibernation in an interstellar void. He’s got a lot of catching up to do, too, between the Civil War, the Hulk’s melee in Manhattan, Tony Stark’s rise to power in SHIELD and the split of the Avengers. First, however, he must locate his lost Asgardian brethren, who are scattered around the mortal plane. It’s a shame that J. Michael Straczynski’s scripts have so far not lived up to the expectations for this major character’s long-awaited return. 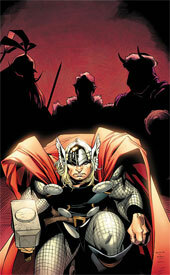 The story he’s provided hasn’t been without its impetus, (that hunt for scattered Asgardians) but it’s missing a hook. Thor is kind of sleepwalking through this title, randomly wandering to spots on the globe and (surprise!!) finding his brothers there without much of a search. And the locations he “randomly” chooses have already been covered so extensively in the news that they’re becoming something of a cliché. Last issue, he was trying to help Katrina survivors in New Orleans, this month he’s mediating a tribal war in an impoverished African city. What’s next, a trip to see the tsunami survivors in Thailand? Thor himself is so stoic and reserved outside of a battle that it’s tough to empathize with him, his battles so short and decisive that there’s no question how they’re going to play out. This book feels like it’s merely treading water, going through the motions expected of it and little more. If Marvel is serious about relaunching the character and allowing the writer to take his own spin on these ancient mythos, why isn’t he doing something a little riskier? I guess there’s the chance that this is all slowly building to something phenomenal, but we’re now four issues in. At some point it’s time to quit setting the stage and start producing something. Olivier Coipel’s visuals, on the other hand, are downright breathtaking. When I bought issue #3 on a whim last month, it was due exclusively to the preview art I’d seen beforehand. He’s taking everything that Chris Bachalo did during his heyday in the late ‘90s, adding his own twist and bumping it up to the next level. His backgrounds are just detailed enough to fill the page with eye candy, but not so line-heavy that they detract from the foreground. His work is superbly realistic, but also overwhelmingly alive and stylized. When he sets the scene of the first page with an exterior shot of a hotel’s sign, he fills the skyline behind it with a flock of birds and a few scattered clouds. It’s shockingly simple, but it also immediately sets the identity of that location: a lazy town in the middle of nowhere, nondescript and happy. Every line he provides to the page is necessary, none excessive. His work isn’t strictly beautiful, either. He renders quiet nature scenes and violent gunfights with the same attention to detail and explosive vigor. His take on Thor is treated with the same amount of respect as his rendition of the more human characters populating the rest of the book. But, at the same time, he gives the Norse God an air of dignity and undeniable power that can’t be overlooked. Coipel is already well on his way to becoming a major player, and his work on a high profile series like Thor is only serving to further catapult him to popular recognition. The new Thor is a mixed bag. The writing won’t be considered among Straczynski’s best, but it’s at the very least headed in a distinct direction and easy to follow. It’s perhaps too easy to follow, actually, because this issue was some really light reading. But Olivier Coipel’s artwork is so astonishing that many readers might want to pick these issues up on its merit alone. On the whole, the “safe” writing makes this an ultimately missed opportunity, but you’ll probably want to borrow it all the same. I can’t hate it, but I can’t unconditionally love it, either.